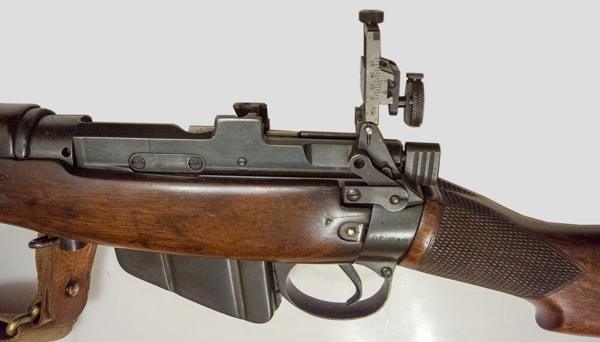 This model is not marked with any manufacturer's specific name or code, although both the No.5 rifle action and some components carry a "B" stamp. This may suggest manufacture by the Birmingham Small Arms Company, but whose usual code of "M47C" is not to be found. 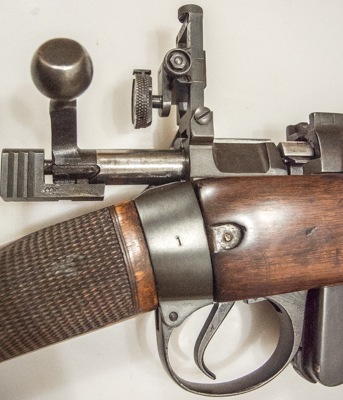 The rifle was purchased at auction in 2005 with iron-work in rather poor condition, and has since been carefully and sympathetically refurbished. Possibly Birmingham Small Arms Co.
Next, left, a view of the rear of the action with bolt open and sight raised. Right, bolt closed and sight folded down. 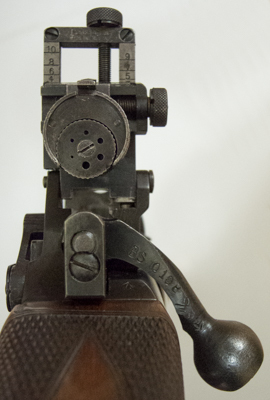 The rear-sight leaf has two scribed lines on its right hand side, presumably for 25 and 50 yard range settings. 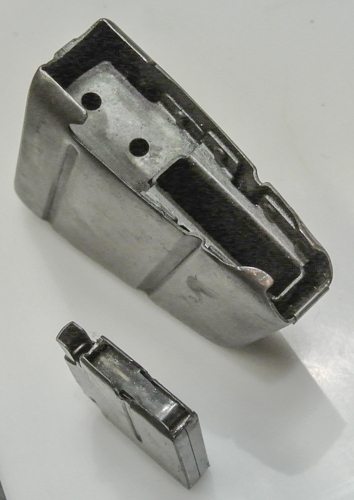 Below, the ejector side plate is evident low down on the flat side of the receiver. The furniture has a plain wood fore-end nosecap, rather than the steel capping later seen. The No.7 (British R.A.F. 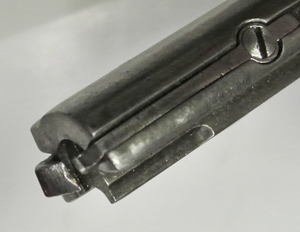 type) rifle bolt locking lug is stamped with the numeber "1"
and the military British Nitro Proof (BNP) mark of crossed pennants. 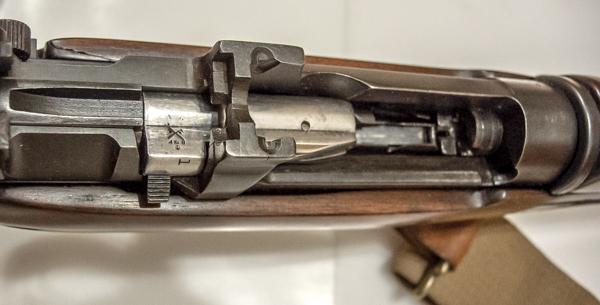 The No.7 magazine insert can be seen fitted into the modified No.4 magazine shell. originally intended for the fitment of the magazine from underneath. There was also a minor alteration to the profile of the side-plates of the unit. The secondary extractor is shown in its groove with its small countersunk fixing screw. to accommodate the .22 long-rifle cartridge rim. 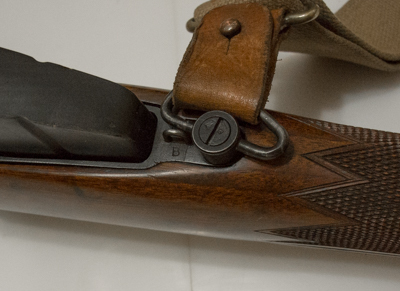 The trigger-guard unit is marked with the "B" of the Birmingham Small Arms Company. 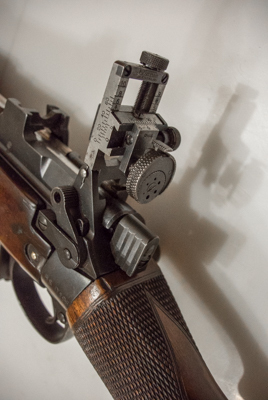 that is the clever combination of the often seen "EFD" mark of the Royal Small Arms Factory (R.S.A.F.) at Enfield. adding the benefit of vernier calibrated elevation on the left of the leaf, in addition to the usual 200-1,100 yard settings on the rear face. 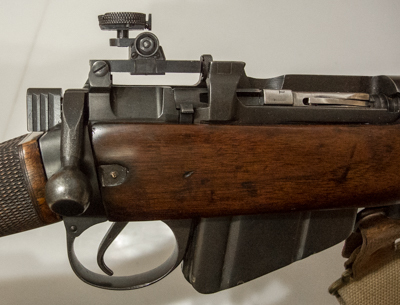 The greatest advantage of the PH4 sight, that was introduced at Bisley in 1946, was the windage adjustment with its own vernier scale, along with the ability to add orthoptic aperture eyepieces, either single or multiple, to both suit the shooter and conditions. More details of this sight are to be found onsite here. The bore is shown below from the muzzle. It is in fine condition. 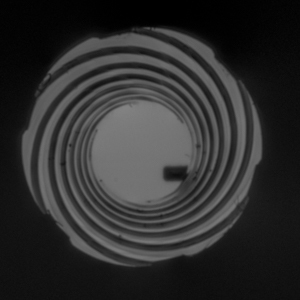 projecting into the magazine-well from the LHS of the receiver. 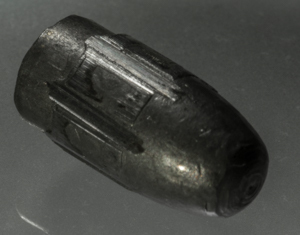 Below are images of the lead slug - in the form of a plain swaged .22 bullet - that has been passed through this barrel. 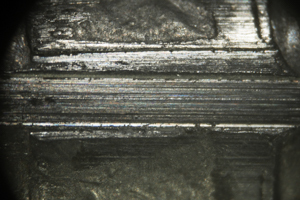 and the compression of the bullet in the grooves can be seen either side.